Our best advice to you is to use your student loan money wisely, and borrow minimally! Calculate your own loan repayments with this handy Repayment Estimator. Financial Aid Exit Counseling – This is a federal requirement when you graduate, leave school, or drop below half-time enrollment. Exit counseling provides important information you need to prepare to repay your federal student loan(s). At ECC, the Financial Aid staff holds in-person exit counseling but if you are unable to attend, click on the following link to complete the counseling requirement: https://studentloans.gov/myDirectLoan/index.action (you must log in, click on ‘counseling,’ select ‘exit counseling,’ and choose Ellsworth Community College so we get notified once it’s completed). Standard Repayment: Everyone is on this repayment plan when they enter repayment unless you request another plan. The repayment term is 10 years. This plan is good for those who want to pay their loans quickly and pay relatively little interest. 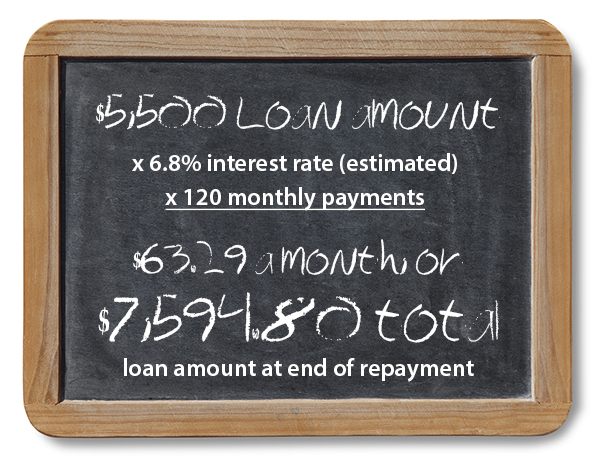 Graduated Repayment: Under this plan, you will pay a lower amount at first and your payment will rise every two years. The repayment term is 10 years. This plan is good if you need a smaller payment at first but you will be able to eventually handle a larger payment. Extended Repayment: This repayment plan is for those who have more than $30,000 in student loan debt. The repayment term is 25 years. This plan is good if you need a lower payment on a high-balance loan. You will pay more interest over the life of the loan than with the standard or graduated plans. Income-Contingent Repayment: The ICR plan is designed to make repayment easier by basing your monthly payment on your income and student loan debt. This repayment plan is intended to help students who pursue careers with lower salaries, including careers in public service. Income-Based Repayment: Under the IBR plan, your monthly payment is calculated on your income and family size. It is meant to help make your student loan payments more affordable. Your payment is capped at 15% of the difference between your income and 150% of the poverty level for your state and family size. Pay as You Earn: Like IBR, this plan limits your monthly payments to an affordable amount based on your income and family size. Your payment is capped at 10% of the difference between your income and 150% of the poverty level for your state and family size. The maximum repayment plan is 20 years; if your loans are not repaid after 10 years, the remaining balance will be forgiven. Unable to make payments on your student loans? Deferments and Forbearance – If you are unable to send payments during your repayment period, call your lender/loan servicer immediately. You may qualify for a temporary suspension of payments. Delinquency – Failing to make your scheduled monthly loan payments will negatively affect your credit. Late payments stay on your credit history for seven years. Your lender, loan servicer, and school will begin contacting you via letters and phone calls, which will continue until you resolve the delinquency. If you are currently delinquent on your student loans, call your Loan Servicer immediately … they most likely will be willing to work with you! A Few Words of Wisdom – There are so-called debt relief companies that sometimes misuse U.S. Department of Education and/or individual college logos in an attempt to sway unsuspecting borrowers into paying up-front or monthly fees for services offered by the U.S. Department of Education and the above-listed student loan servicers for free, including consolidating federal student loans, changing repayment plans, resolving defaults, filing requests for borrower defense loan cancellation, and other benefits and services that students are entitled to receive at no charge. When in doubt, we urge you to contact your loan servicer directly, or contact the ECC Financial Aid Office.